Today in CSE-612 we explored maps as message transmitting tools. 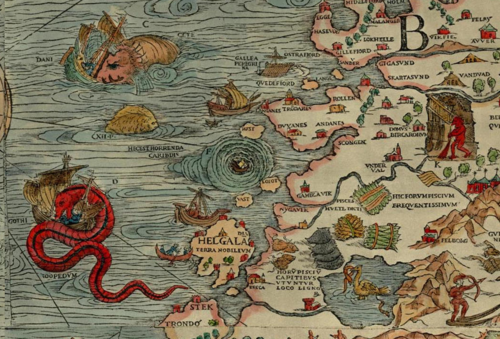 We often think of maps as literal, one-to-one artifacts that represent the real world without bias. But in fact, like any communications medium, maps are inherently a product of subjective humans with their own perceptions, and agendas, and they reflect a variety of decisions, compromises, or misconceptions of their creators. The same could be said of any artifact that is meant to convey a message or a lesson. When designing a course, creating an inforgraphic, composing a Tweet, or authoring a blog post, we all make decisions about what information we will acknowledge and address, and how we will choose to represent that message to our audience. In a way every time we communicate we are drawing a map for someone to follow; to arrive at an idea, concept, or point-of-view. What it comes to maps, what features make the cut and the ways they are represented can say as much about the author as the terrain.